Greetings everyone! 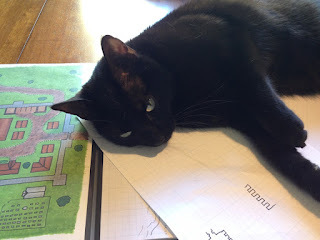 Welcome back to Maps and Meows, my irregular guest feature where I draw fantasy maps. 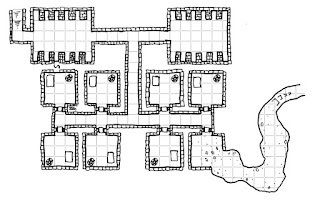 This week's map is a continuation of my last article, the Lakeside Temple. Beneath the main church of the lakeside temple is a the resting place of many of the Virtuous Order of Salara's greatest heroes and leaders. This large crypt has two large burial rooms lined with burial alcoves. There are also eight individual rooms, each of which are the resting place of a single great hero. Inside each is a sarcophagus and a statue commemorating the hero. The map is hand-drawn on 8.5x11 Bienfang 4x4 Gridded Paper. 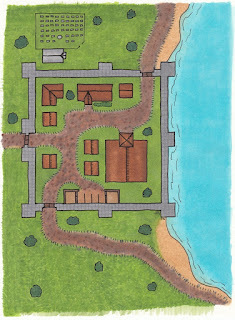 Like the Lakeside Temple map, I drew this using Faber-Castell Pitt artist pens. 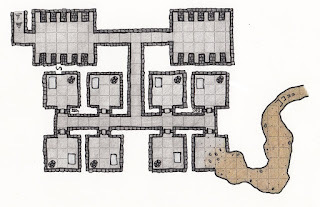 A fine tip (0.5mm) pen was used for the walls of the dungeon. All details (debris, doors, stairs, brick outline on the walls, etc) were drawn with a extra-small tip (0.1mm) pen. 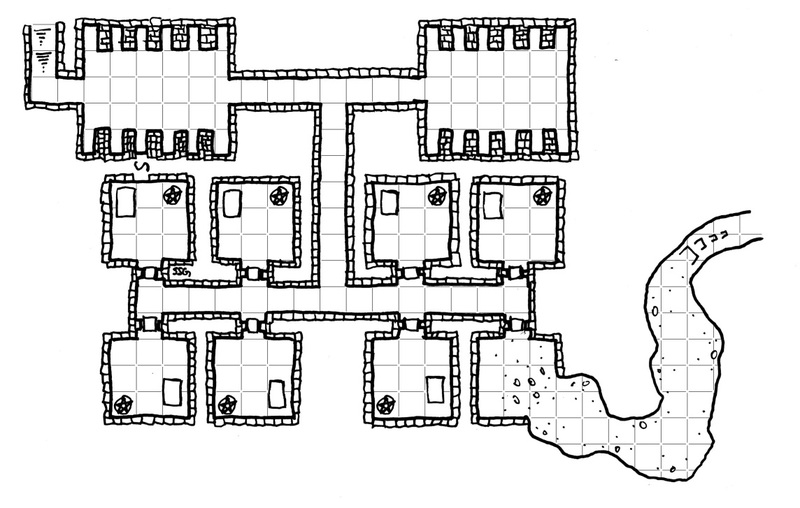 After I finished the hand-drawn map, I scanned it into Photoshop as grey-scale at 600dpi. I applied a Anisotropic Diffuse filter to soften up the lines. I then created a second layer underneath the map, which I filled with a 600dpi grid fill pattern that I've created previously. Using the wand tool on the map layer, I select and delete the interior sections of the map so that the grid layer beneath shows through. After the map is complete and cleaned up (for example, I messed up on some of the statues, so I copy/pasted the best statue and replaced all the other statue icons with it), I exported as a 150dpi JPG for posting here. If I use this in a published product, I will export as a 300dpi TIFF for pulling into Scribus during layout. Sarah colored the map with Lyra Polycolor colored pencils. I just wanted to touch base one more time, and let you know that I haven't disappeared or abandoned this blog. Shortly after my last post, I had a major family emergency that took me out of state for a few days. That's mostly resolved now and life is settling back down. Next week is also my four year anniversary with my wonderful husband, so I suspect it'll be another week before I can get back into a regular routine. Sorry about all of this, and thank you for your patience! I'll see you again soon! Greetings! Steve here, with a special guest appearance for Mondays that I'd like to call Maps and Meows. Last year, I started drawing my role-playing game maps by hand after being inspired by a couple popular cartographers. As a semi-regular feature, I plan to post the finished black & white map with a description of the location along with some details on the materials and techniques used to create the map. This week, Sarah has also colored the map. At this lakeside temple, priests of the Virtuous Order lead in worship of Salara, the Lady of Crusades and Righteous Action. The Virtuous Order of Salara is a militant organization, and as such their temples are built more like a fort than a church. Built at a three-way intersection, this temple is surrounded by large stone walls patrolled by warrior-priests. 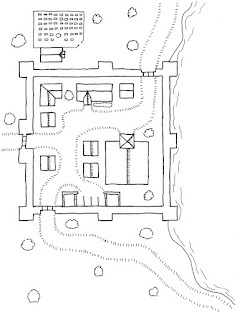 Inside the walls are stables, a barracks where the general clergy live, a few homes, an inn for accommodating travelers, and the primary structure: a large church. Outside of the north wall is a cemetery built to honor the fallen warriors of the order. 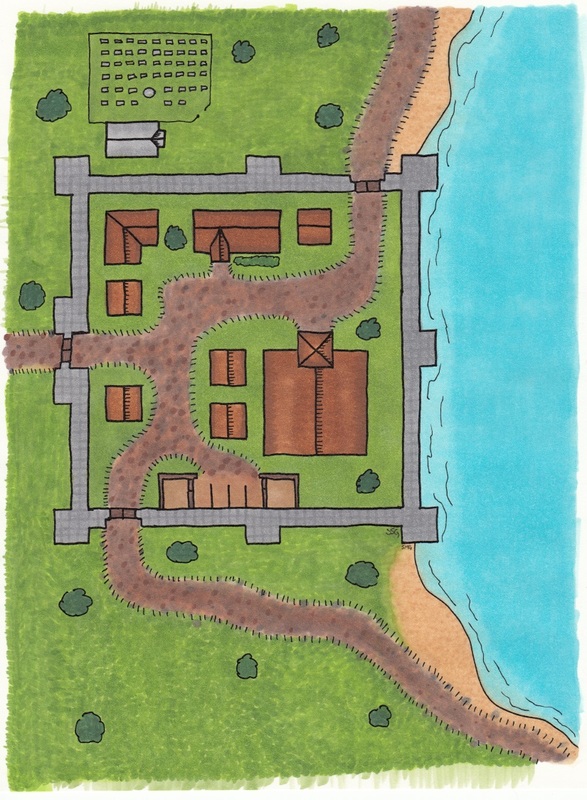 This map is hand-drawn on 8.5x11 Bienfang 4x4 Gridded Paper. This paper is especially nice because the non-reproducible blue lines don't show on scans of the map, which means I have a lot less work to do after scanning when I'm cleaning up the image. For this map, all the lines are drawn using Faber-Castell Pitt artist pens. A fine tip (0.5 mm) black pen was used for the walls of the outer walls and inner buildings. I used a small tip (0.3 mm) for the road and trees. All other small details were drawn with an extra-small tip (0.1 mm). I recently picked up these pens. Most of my other maps have been drawn using Sakura Micron pens, which I also really like. The Faber-Castell pens are very comparable, are slightly more expensive, but come in sizes that fit my needs a little better. You pretty much can't go wrong with either brand. 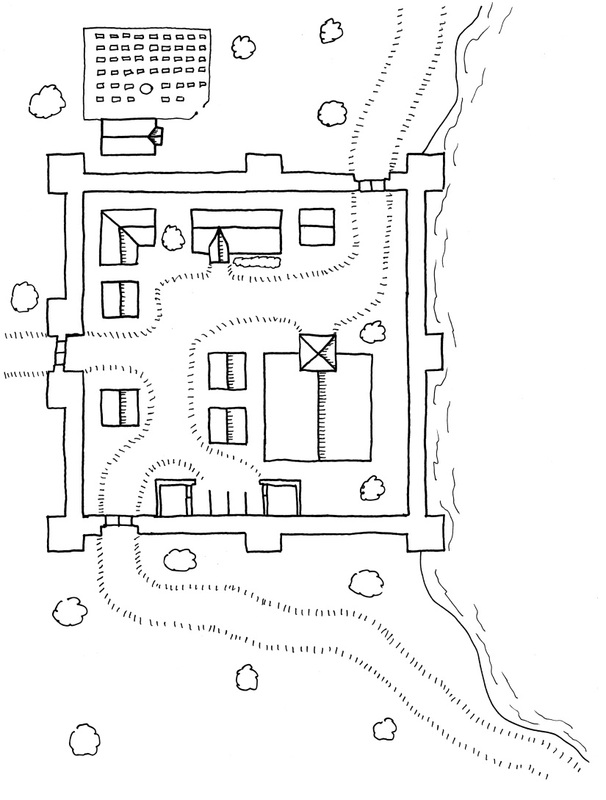 After I finish with the hand-drawn map, I scan it on grey-scale at 600 dpi into Photoshop. A color scan will also pick up the blue grid-lines, but on a grey-scale scan they don't show up at all. I then run the whole map through the Anisotropic Diffuse filter to soften up all the lines. From here, I clean up any mistakes and blemishes, and typically reduce to 300 dpi and export in a loss-less format like PNG to be used for publication. I chose to color the map with Copic markers. We have a laser jet printer, and the toner is completely Copic friendly, so I had Steve print it onto Canson XL Recycled Sketch paper. I started by laying down base colors: B00 for the water, YG13 for the grass, E70 for the roads, E000 for the sand, and N1 for the stone. This guarantees that there will be no white paper showing through on the final image. I don’t worry about fully saturating the paper or getting the color smooth and streak free; any imperfections will blend in as I layer in the other shades. After the base layer, I typically start coloring with the smallest areas and work towards the largest or background parts, so that any mistakes are easier to hide. The trees were a combination of G28 colored smoothly with G29 scribbled over that for texture. For the buildings, I used E37 in layers to create a shaded appearance to highlight their peaks, and then just on the edges of the roofs, I feathered in E27 for additional depth. The stables are a mixture of E55 and E13 to represent straw and blend with the road. The stable walls are colored with E13 and E27 in a rough wood-like pattern. The roads were next; E74 was stippled (dotted) over the entire base layer, then E13 was applied all over that to blend some of the dots out. From there, I used T5, T7, and E29 to add additional rocks and irregularities, followed by another layer of E13 to pull everything together. The sand and outer grass were also colored using stippling, E31 and E33 for the sand and G43 and YG17 for the grass. The smooth grasses inside the cemetery and fort were colored smoothly using a layer each of G43 and G24. The lake was a slightly rough layer of B01 with another layer of B00 to blend it. The temple walls were colored with N3, and N4 was used to add a rough outline of stonework. I've been trying to get a post out every two or three days, but I'm still getting into the blogging routine. I have a few posts in the works, however, so here's what you can look forward to in the next week or so. First off, I picked up the shiny, new Aluminum Copic Marker Case, and I'm going to be writing up a review of it. I'll give you a heads-up though, I'm not impressed, and I likely will be returning it. On a related note, I'm going to share how I've been storing my Copics as well as my new storage that I just picked up today. Hopefully, I can get a nice how-to out this week as well. 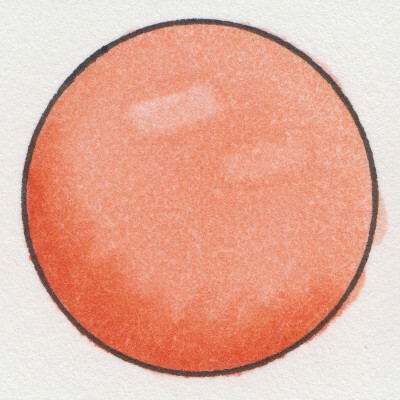 I also recently tried out PanPastels for the first time, and I liked them enough to pick up a total of ten colors. They're pricey, but I found them on clearance (woohoo! ), and I've been seeing some really great work with them for coloring page backgrounds. I'll be trying them on a few more pages before I give them a full review. Finally, and the most exciting for me, my wonderful husband (who spoils me) bought me the 60-count box set of Faber-Castell Pitt Artist Brush Pens, and now that I've got my color chart finished, I can get to actually using them. I previously had the pastel six-pack, and I've enjoyed them quite a bit. I plan to do some coloring and give them a full review. Lots to look forward to, so I'll see you again soon! As a bonus, here's a picture of the cats enjoying their new window bird feeder! The house finches don't seem to mind the cats much! I love coloring books. It also shouldn't be a surprise that I have a lot of them. Typically, I bounce back and forth between books based on what type of medium I plan to use, how detailed I want to be, and what style I feel like coloring. When I buy a new book, I usually color a page or two before it winds up on my shelf to be grabbed when it suits my mood. 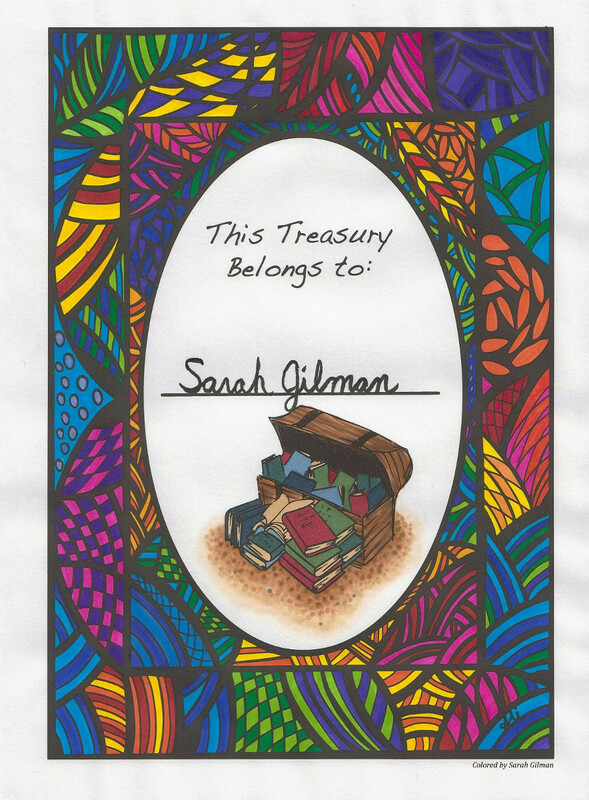 A rare exception to this pattern has been the Adult Coloring Book Treasury. 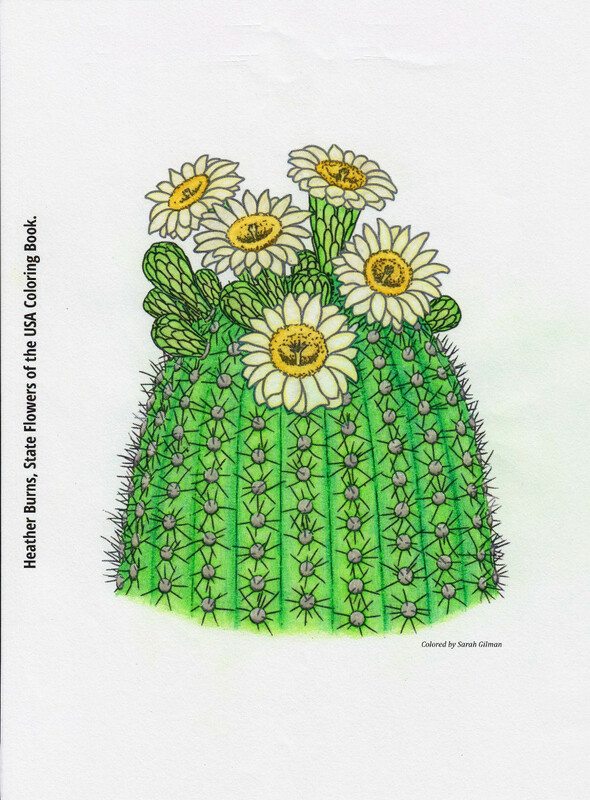 The Adult Coloring Book Treasury is a collection of 110 images from 55 different artists. The pages are decent quality and should perform well with colored pencils, pens, markers, and possibly even light watercolor. After getting my book, I promptly cut off the binding, stuffed the pages into sheet protectors, and put them into a nice binder. This way, I can easily grab a page to color with whatever I want to use, and when I finish, they're all nicely kept in an easy to show off format. The illustrations range from doodle-style drawings with quotes to highly detailed works of fantasy art. I've never picked up a book with as much variety within its covers. It also includes information about each artist to make it easier to find more from those whose style you enjoy. The best thing about this book is the price; it's sold at cost on Amazon for only $6.14 normally, but it is currently on sale. I realize that I probably sound like an advertisement up to this point, but it's because I genuinely love this coloring book. After I got mine, I promptly ordered both my mom and mom-in-law each a copy, and they've both enjoyed it as well. If you're looking for a cheap way to explore different artists and styles, you really should pick up this book. There's something in it for everyone. *I use affiliate links where possible. What this means is that I get a small commission for any purchase you make via those links, and it costs you absolutely nothing. This allows me to afford more neat stuff to test and review! 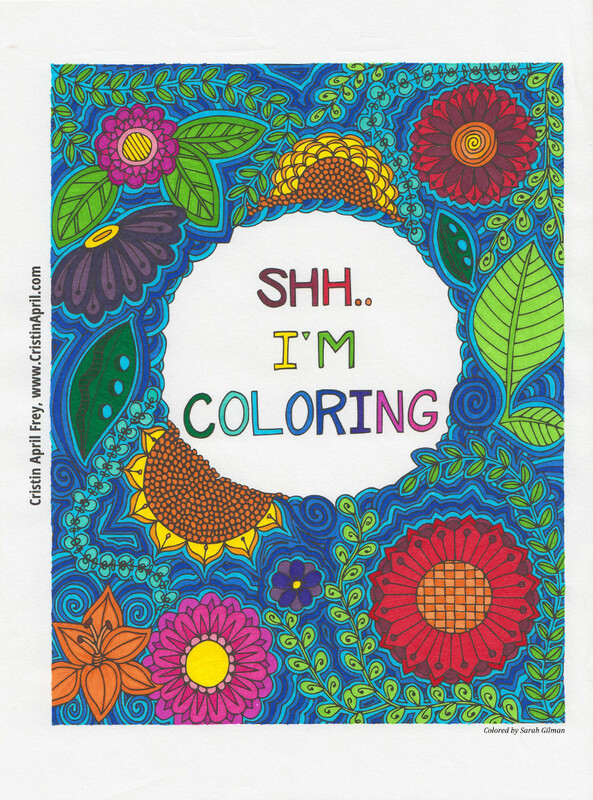 During a recent phone call with my mom, she told me that she has "too many coloring books". Ha! I say you can't have too many coloring books. Different books suit different moods and mediums, and there are so many that are pretty! 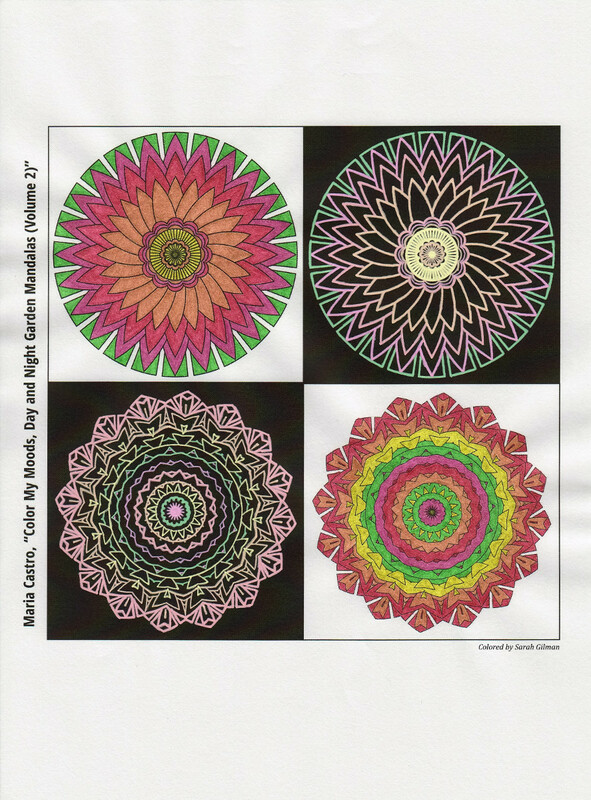 I picked up a great find tonight at Target for only $4, the "Premium Coloring Pages: Florals & Botanicals", and it advertises 24 "artist quality" 8"x10" acid free pages. I'd been looking for a more watercolor friendly book to use my Derwent Inktense pencils and blocks with. The pages are a soft white, and they are quite thick, close to my 140lb student quality watercolor paper, but with a medium tooth at most. The pages are perforated well, which is a big plus in my opinion, and they tear out well as long as you fold them along the line first. The pictures are a mixture of doodle/tangle type that go edge-to-edge, text with doodles, and more realistic sketch-like images. At first look, I didn't think there would be anything I'd like, but it actually has a decent variety of styles within the theme. I chose a picture that would allow me to focus on testing the paper, rather than coloring little details. I used a fine water brush primarily with my Inktense blocks. I purposely over-saturated the paper a few times and scrubbed pretty hard to try to damage the paper. First off, despite my best efforts, I wasn't actually able to really scuff the surface much at all. The paper took my abuse like a champ with very little pilling or peeling. It did buckle a bit in the blossom, especially while it was still wet, but once it dried, it mostly flattened out again. I'm pretty sure that you won't be able to see any buckling at all after a night under an old calculus textbook. If you happen to see one of these books, I'd recommend picking it up. At only $4 from Target, it's cheap and will probably take most coloring mediums you could throw at it. 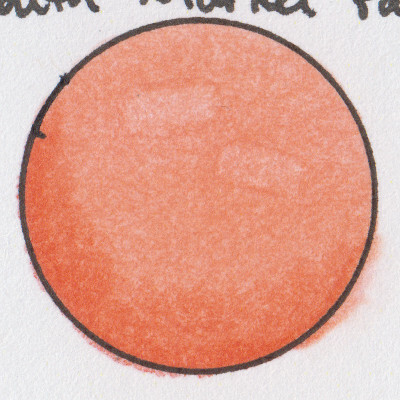 I know I promised a review of Copic's markers, and I will get to that sooner rather than later, but I'm going to get the ball rolling with the results of some paper comparisons that I just finished. You don't need special paper to use Copic markers, however, the paper can make a big difference. 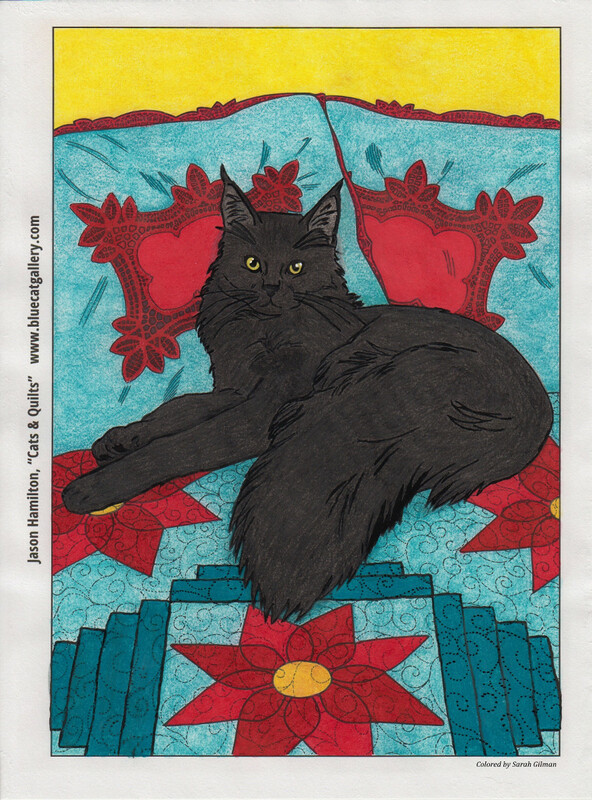 You can use your cheap copy paper or standard coloring pages, and the markers will work just fine, however, you won't get the same results as you might with a heavy card stock or quality marker paper. Some paper accepts multiple layers of ink better than others, some will bleed past the lines on just one. Other papers will bleed through (which is not necessarily a bad thing), while the ink just sits atop certain types. Your preferred paper may not be the same as mine; it will depend on what look you want to achieve and what you plan to do with your final result. I purchased all of these papers myself, locally or through Amazon, and this is by no means an all inclusive list. I haven't seen many of these papers tested elsewhere. Don't overlook a paper just because someone else didn't have good results with it; look at their test results and see why they didn't care for it. If they had a lot of bleeding past the lines, then it's probably best to look past it, but if they dismissed it for other reasons, it's worth considering if you should test it for yourself. My testing process mostly follows the method described by Marianne Walker on her blog, I like Markers. I used YR61 and YR68 for my tests. 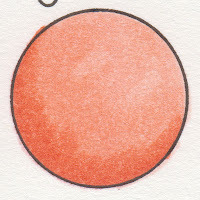 I don't use oranges very much, so I don't have to stress about using up colors that I use regularly. I don't have perfect blending groups for every color, so this allows me to see how well I can blend two colors that aren't side by side on the chart. 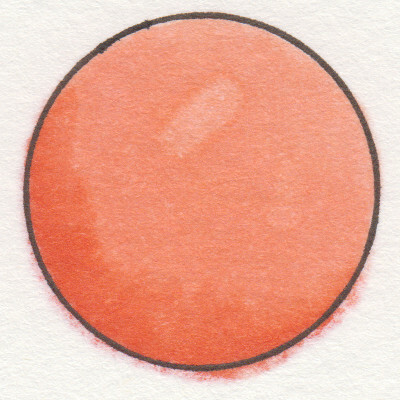 After the ink has dried for at least 10-20 minutes, I fill the circle with a light color, going up to, but not over the line as much as possible. If you go over, make a mental note of where you did, so you don't fault the paper for bleed over in those spots. Oops! I went over near 4 o'clock. While the ink is still wet, I layer a darker color over the top and feather it out towards the circle to add depth and see how well it blends at this stage. This is the point that some of the papers start to show substantial bleeding/feathering*. If the paper can't handle multiple layers of ink, then it will be difficult to blend while staying in the lines on an actual image. Harsh lines, means the ink doesn't feather into itself as well without help. Again, while the circle is still wet, I use the light color again to blend out the darker color as smoothly as I can. For me, this is the most important result. I want to see a smooth blend with little or no bleeding past my line. 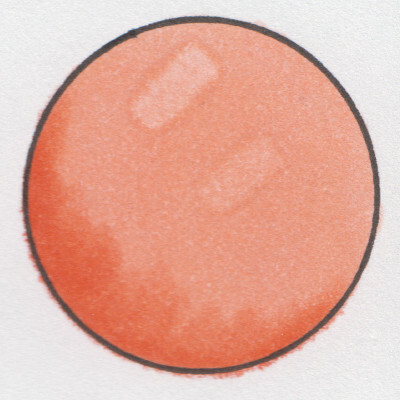 If I can't get a smooth blend, but the paper doesn't bleed out, then I can use it for flat coloring or simple blending or shading. If it bleeds a lot at this point, then it is probably only good for quick projects without this many layers. Almost looks like a fruit. Now I want a peach smoothie! Last, after the ink has had a few minutes to dry, I use the chisel tip of my colorless blender to test how well it will push the ink. 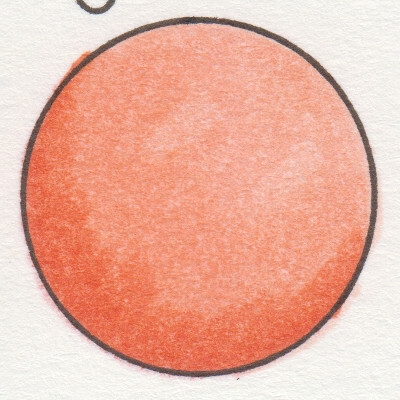 I first press and hold (lightly) for approximately three seconds, then I pick it up, move to a different place in the circle and simply press it to the paper and lift. The two marks give me an idea of how much the blender will affect the ink on this paper with different amounts of effort. Most papers will show some result if you put enough work and time into it, but I don't want to use an entire marker full of blender solution on one image! *When I say bleeding, I do not mean bleeding through the page unless I specifically say so. What I am referring to is the bleeding past the line; some people call it feathering, but I prefer to save that term for the blending method of the same name. I've noticed that the bleeding/feathering looks worse on the high resolution scans than it does in person. These circles are one inch diameter, so you are seeing them zoomed in quite a bit. Keep that in mind as you look at the results. This is our regular, every day printer paper, just to show you that paper cost does not directly correlate with how well it performs. 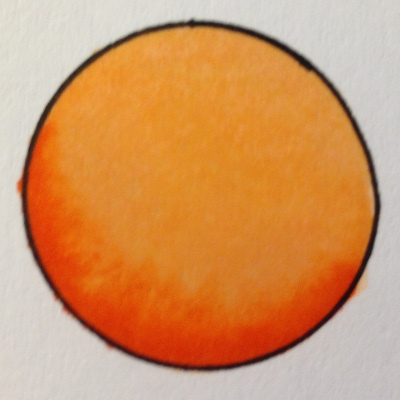 This paper barely bled past my circle, and blending wasn't great, but it is definitely possible with some effort. The colorless blender shows up very well, leaving crisp lines with only a light touch. Who says you need fancy paper to use Copics? I love it for sketching, but this paper is awful for Copics. One layer bled past the lines before I could even finish saturating the paper. I didn't bother testing beyond that. Uneven coverage and it looks like I didn't even try to stay in the line. Also very prone to bleed out. Blending is possible, but takes a lot more work with this paper than others that I tested. Probably good for drawing, not so much for marker. After testing the other two, I was surprised by this paper. I still wouldn't recommend it, but it's not terrible. 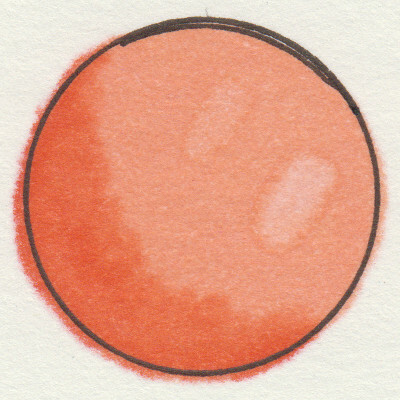 It didn't bleed past the circle nearly as bad as some of the other papers, and blending was actually decently easy, but the colorless blender effects aren't quite as crisp or clear. It also has more tooth than the other papers I tried, which made the markers feel like they snagging on it. I really did use the blender. 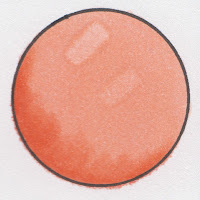 I've seen some people who like to use Copics on watercolor paper, but I feel like I'd use up so much ink. The paper just sucked up the ink so badly that it took forever to get clean coverage. I suspect that this is the same reason the blender didn't show up very well unless I held it on the paper for a very long time. The only nice thing I can really say about this is that it didn't bleed through as much. The bleeding is much less pronounced to the naked eye. This paper is a bit of a hidden gem. I picked it up from a local Joann Fabrics with a coupon for something like $2.50. The brush tips glide over the paper very smoothly. 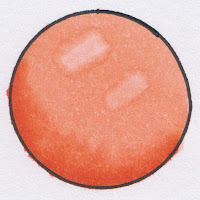 There is very little bleeding, but unlike some "marker" papers, it does bleed through instead of holding the ink on the surface of the paper. The ink blends smoothly and easily, and the blender works very well. The only real negative I found with this paper is that it does get a slight speckled look when you really saturate the paper. It's probably not best for all final products, but if you don't mind that, or you are just practicing, this is a surpsingingly great paper. Don't blame the paper for my lack of a steady hand. It didn't bleed out nearly as bad as it looks. This paper also feels really good with the markers. It's very easy to get smooth coverage, and there is little to no bleeding. The blender leaves very pronounced effects, but it's a bit hard to blend because the ink seems to dry faster on this paper. Still, it is possible to blend, and this paper is otherwise very good. Nice, clean white, and feels nice! I believe this paper is coated to help keep the ink on top of the paper, rather than letting it soak into the fibers. There is virtually no bleed out because of this, and it didn't bleed through onto the paper I had beneath it, but you can see the ink on the other side. It takes layers of colors very well, with the most pronounced effect of all of the papers, getting darker with each layer of the same color. 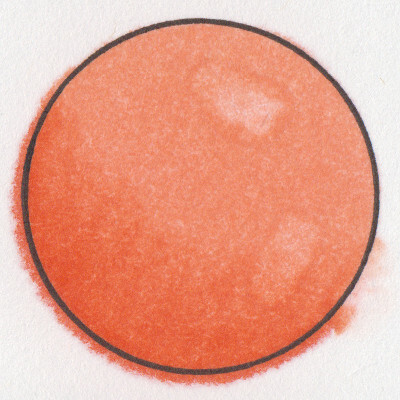 If you use the most common blending techniques, this paper probably isn't for you; it tends to just push the color around more than mixing them. I use this mainly to put underneath what I'm actually coloring since it's thin and stops the ink from bleeding through to my surface unless I practically force it. Maybe I was cold when I colored this one. Another really great paper, I was pleased by how well this paper performed, especially for the cost ($10 for 100 sheets at my local Hobby Lobby, then 40% off). There was little if any bleeding past my circle, it blends very easily, and the blender works well. It does have a bit of the speckling that I also saw in the Strathmore 100 YA Marker Pad, but it's not nearly as noticeable, and I wouldn't have a problem using this paper for something final. Or, maybe I'm worse at staying in the lines than I thought. The left side more accurately shows how the paper performs. Most Copic artists recommend the Neenah Classic Crest Solar White card stock, but when I looked at the test results, I noticed that almost everyone had trouble with the ink bleeding past their line. Upon further research, it seems like a lot of people prefer this paper simply because it's the one most of them learned on, so they're used to how it handles. I didn't feel like spending $40 or more for 250 sheets of a paper that I didn't think I'd like, so I decided to try this, knowing that my husband or I would use it for something else if it didn't work out. 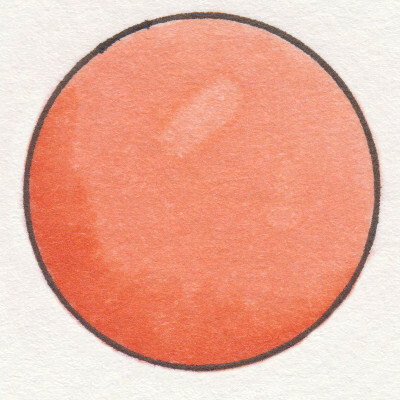 It's good that we use card stock a lot, because I won't be using this for coloring with Copics. It was one of the worst papers for bleed out that I tested. One layer was fine, but as soon as I started blending, it just soaked out past my circle like it was on fire. I did like how well it blends, and the blender works well. Perhaps in the future, I'll pick up a sample of the Classic Crest for testing, but I don't see myself buying a full ream any time soon. Maybe the ink just wanted to explore? This is my favorite paper of all of these. It's very easy to blend on, has virtually no bleed out or speckling, and feels very nice to color on. The blender works very well, but it's a bit hard to erase mistakes once they're allowed to dry completely. I tested the Mini Pack, because it was available at Hobby Lobby for $4.99 before my 40% off coupon, but you can also find it in sketchbooks up to 11"x14" with a black cover or 9"x12" with a white "writable" cover and in packs of 25 loose 8.5"x11" sheets. 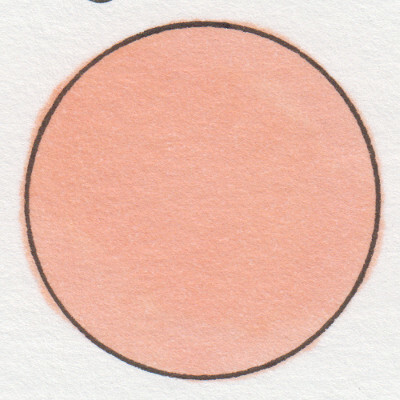 This is what a nicely colored circle looks like. My preferred paper is the Copic Sketchbook paper. It was the easiest to blend on, and the final result looks great. It's a bit pricier per page than some of the others, and if you plan to print on it, you'll have to either cut it to size, or pay a bit of a premium for the pre-cut loose leaf pack. However, it's still not a bad price for premium quality card stock, and you can try the Mini Pack before investing in a bigger quantity. Honorable mentions go to Bee Paper Pen Sketcher's Pad and Canson XL Sketch, both of which are decently priced. If you are specifically looking for a card stock, these won't suit your needs, but if you want an affordable paper that you can color or draw on, either of these should do the trick. I'd also like to highlight the Office Depot Multipurpose paper. I really didn't expect this to work nearly as well as it did. It's very inexpensive, especially if you buy the large boxes, and you can find it at most Office Depots. If you just want something cheap to try that you don't have to worry about wasting, pick some up! **I use affiliate links where possible. What this means is that I get a small commission for any purchase you make via those links, and it costs you absolutely nothing. This allows me to afford more neat stuff to test and review!